Earlier today, at an event in Ghana, West Africa, Motorola introduced its Moto Z handsets, the Moto C and some other models. At the same time, the company introduced the Moto 360 Camera Moto Mod for the Moto Z and Moto Z2 line. As you can tell from the name, this is a camera allowing users to take images and videos for a panoramic view. Like all Moto Mods, the accessory attaches to the back of a Moto Z or Moto Z2 handset using magnets and the 16 pins found on the back rear of the phone. Tipster Evan Blass tweeted a picture of the modular accessory this morning. It shows a white dimpled back with the Motorola batwings logo in the middle. On top is a round 360-degree camera that is attached to the unit. Unfortunately, details are sparse and there is no word yet on pricing or availability. Other new Moto Mods recently unveiled include the Moto Gamepad, JBL SoundBoost 2, Moto Turbopower pack and the Moto Style Shell with Wireless Charging. Like the newly introduced 360 Camera Moto Mod, these are compatible with all Moto Z and Moto Z2 handsets. I must say that I won't be buying that. Cool. But I just wouldn't use it. I think Lenovo knows that a lot of these mods are niche type items that won't appeal to a lot of people, but having that flexibility makes the Z line look good. The Moto Mods featue is poorly implemented. 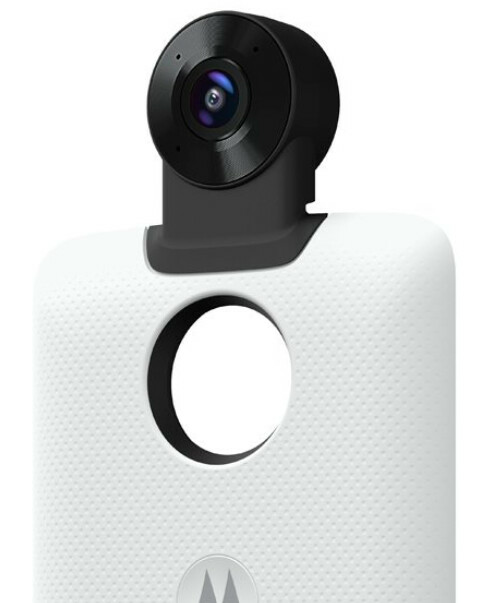 You put on a huge back cover just to attach a 360 camera ? Look at the Essential phone, that has a very simple yet effective add-on implementation. Yeah, that would definitely make these mods a lot more appealing, even more than their phones IMO. I'd definitely grab the IR and 360 camera mod.